Fair warning – I am not planning on adding this as a download, as it really is useless unless you buy this book. I did buy it and read it and love it. In the past, when I have been successful in dieting it has been down to cutting out carbs and most fruit. We have always eaten a ton of veg and lentils, black beans, white bean mash, but far too much meat. This version of DASH (Dietary Approaches to Stop Hypertension) doesn’t cut out any one food group. It seems like a plan that is sustainable. But making sure I am getting everything I need while not overdoing things in certain areas was always going to take some planning and attention. So I created my own personal planner that has the bits in it I need. I have been using it (since yesterday when I began the Phase one diet properly) and so far it IS helping to keep me on track. I was happy to share it on the FB Support group (kindly linked to me in a comment by follower Bridget) because the folks there have the book and can make use of the very specific info – and won’t be misled by the abbreviated info in the charts. I also made a sheet that tracks my weight, blood sugar level and activity – this is the first version, the final one includes tick boxes for water consumption. I also did a sheet that highlights many of the meal suggestions for the Phase One portion. I figure by Phase Two I’ll have a better grip on it. Plus it is too hard to squeeze as much info as I would need in a small sheet LOL! I have the book to refer to. 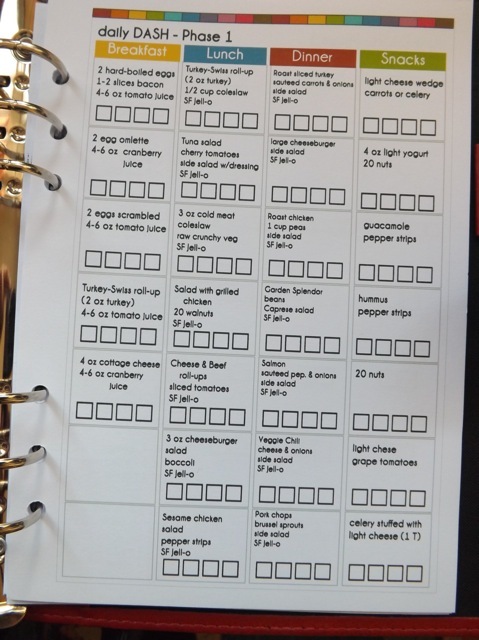 The tick boxes are so I can keep track of how many times I have a particular meal over the week. Phase One is only two weeks so this sheet is only useful for a limited time. There is a Phase Two serving checklist too, that will become the bulk of the planner over time. But it also occurred to me that many people won’t have a planner. And aren’t going to be keen to buy one just for tracking their diet. So I re-jigged the layout so the sheets can be printed on an A4 or US letter sheet, sideways, and used in a standard 3-ring (or 4-ring) binder. I was lazy and cheap and printed these on printer paper, standard quality, hence the colour difference. What I did notice in that process is that the meant-to-be-cut pages won’t work in a binder like this – the sheets are flip-flopped, so the MON-WED days are on the RIGHT rather than the left. Of COURSE it wasn’t going to be easy. But hey ho. I feel lucky that I have the skill (sort of) to customize a personalized planner for specifically what I need to plan for. And it makes me realize why I found it so hard to create a “generic” planner for OTHER people to use. Everyone has their own ideas of what a planner needs. I remember back when we used NeXT computers, post-PC, pre-Mac. There was an object-oriented programming tool that let you group individual bits of code just the way YOU needed to, to build a program without starting from a blank screen. It fascinated me, and made so much sense. 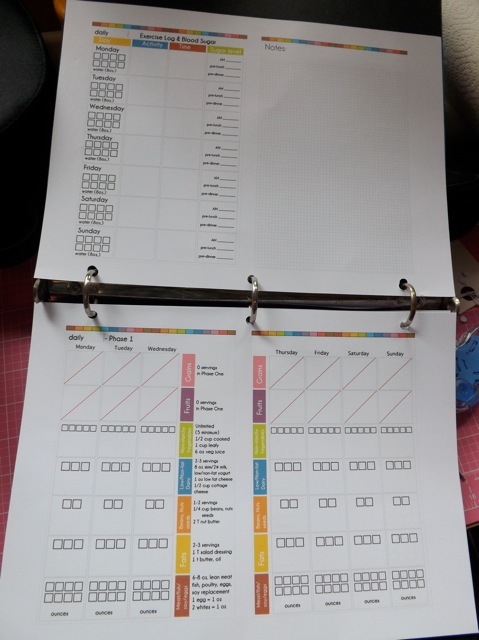 Wouldn’t it be totally cool if you had little building blocks for a planner that you could drag onto a properly sized blank page, and its reverse, to create your own customized version? And change the colour or font with a click? 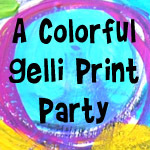 Then just send it to your printer and BAM! WHAT? Prefect planner! Categories: musings, planners | Tags: planners | Permalink. I would love a copy of your planner. It is well made and I think it will help me a lot. Would you be willing to share your planner me too? So organized and easy to use! Thanks in advance. Bought the book you recommended – am earnestly starting DASH! Is there a way to access your journal sheets? Can you send or may I purchase? Thanks so much. I would love to get a copy of your dash diet planner. I’m trying to get my husbands blood pressure and cholesterol under control with this diet and your planner looks amazing! 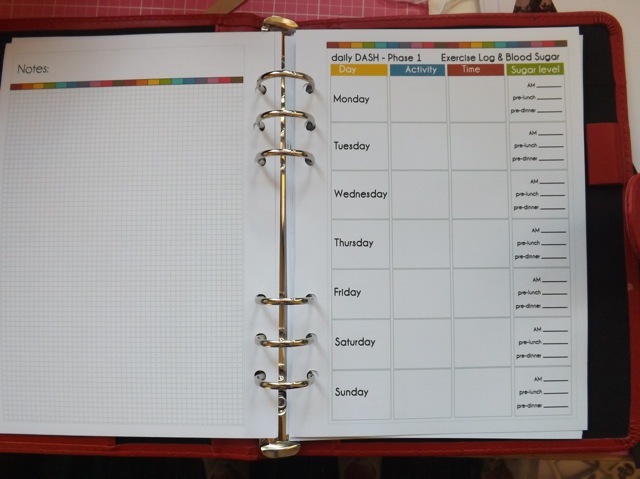 I’m looking for a easy way to track DASH diet in my planner and was hoping to get a copy of your printables. I’ve got a month left to make some progress on my goals…Already down 13 pounds!! Are you still giving away your DASH diet planners? If so I would love one. My husband’s doctor just put him on this diet and this would help A LOT. Thanks so much!! Hi! I would like a copy as well. It looks like something that can help me wrap my mind around this as my husband and I are starting this diet due to his high cholesterol an my weight. I am new to the Dash Diet and in all my searches, your information was the most organized and helpful. I like how you created a planner based on the needs of this yourself and program. May I please have a link to your planner. I think this is something I can utilize to stay on track. I would love a link or pdf to download these pages, awesome job. I can’t find anything on amazon remotely close! My doctor suggested I try this Dash Diet. And when I search online it’s over whelming but I think your planner might help me organize my meals. May I have a copy of your planner? Please and Thank you! May I please have a link to your Dash Diet planner? My husband and I are going on the dash journey!! I am sad though that there is not alot of information out there, but am glad for the facebook group. If you’d please, I’d like a copy of your Dash Diet planner. My husband and I just began following the plan. Of all the planners “out there,” your seems like it would be the best fit for us. Thank you! i’m about to begin the dash diet, and searching anything that would help me..
can i get a copy too, please? 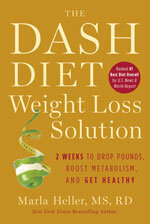 My mother and I recently purchased The DASH Diet Action Plan book due to our weight issues and hypertension. We are very interested in obtaining a copy of your planner. It looks like a great resource to help us be more successful on our healthier lifestyle and weight-loss journey. Thanks in advance for your help. Hello!! I just love what you have done here! I have had hypertension in my family and have just been put on the DASH diet at only 33 to drop my BP…. I have tried many diets and made planners such as you have here but none to your extent.. its is impressive and the perfect tool to keep on track! I would love a copy if you can send a link or send one to me? Thank you for sharing your story!! 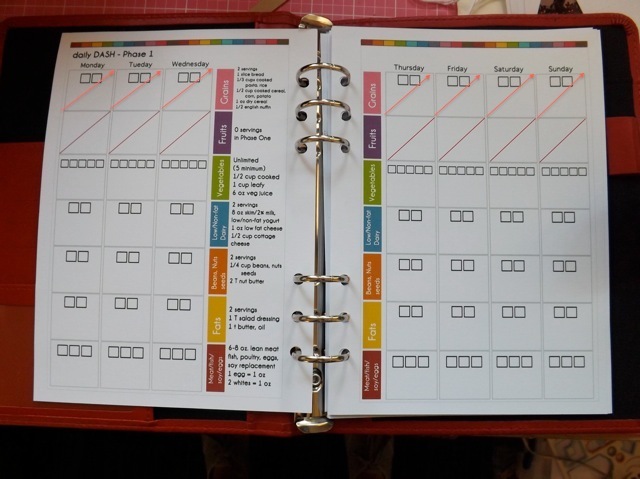 Your DASH diet planner is just what I’ve been looking for to keep my husband and I on track! Thank you so much for sharing your hard work so others can be successful. May I please have a copy of it? Love the planner, could I please have a copy? Thanks ! Please send me your planner. It is awesome! Exactly what I need to stay on track with DASH. Had heart surgery last month and was put on the Dash diet. I bought the book and was looking for check list and found your blog. Was wondering if I could get a copy of the planner for the dash diet. I would really appreciate a copy to keep me in check. Thank you for your help! Can I get a copy too? This is amazing!!! I am just at awww. I also bought the book and started to create a checklist for myself and then I thought maybe there is a tool online. I found your post/blog and would greatly appreciate a copy of the planner for the dash diet. I need all the help I can get. I would love a copy too. I’m getting ready to begin the dash diet and need all the help I can get. You are amazing! I would like the link as well, if that is possible. Hi! May I have your link of your DASH Diet checklist. It looks very helpful. I love your planner. Just starting DASH, and I was hoping to find something just like this to keep as a checklist. Could you send me a link? I was looking all over the Internet for a Daily Planner suitable for the Dash diet, and at last I have found the perfect one. Yours ! I hope you were successful with the DASH, and would dearly love to make daily check sheets like yours. Dieting is not something I have NEVER been good at! I would also love to have a copy if this it would be so helpful for me! I too would love the link to your download for this awesome planner! 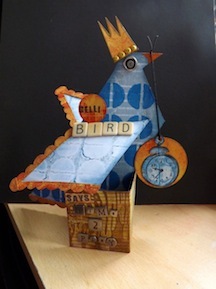 Lots of work – Looks great! HI, I would really appreciate your handouts if possible. They could really help me. Thank you in advance. I would love to have a download link for the Dash Diet planner. Thanks so much. I would love a copy of your planner pages….do you publish them? Doctor tells me my blood pressure is “scary high”. Thanks for that non-stress inducing phrasing! Immediately bought the book. Would you please share a download link for your planner? Just bought a planner and was looking for a Dash diet planner insert, hoping that someone created one and a Google search brought me to your page. I would love to have a copy of this file, if possible. Thank you for your consideration. Awesome planner! Could I get a copy as well? Wonderful – it should help keep you on track. When you need more room, why not have a fold out page, just print it landscape and attach it to the portrait page? Hi there! In DAILY DASH Phase 1, second one from the bottom, I think you mean broccoli? Perhaps you overlooked the missing r, so I mention it. 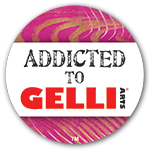 You put a real lot of effort in all the downloads you share.Thank you for that! I’m not going to use this one though, altough I need to loose weight too. Luckily, that particular page is not one I am sharing anywhere 🙂 I’ll fix it, just cause you spotted it and told me, now I can see it,and it’ll bug me. On the plus side, I’m only using it for two week, then that page becomes useless. That isn’t even in the Top Ten of my stupid mistakes LOL! It is a good diet, but the problem is it really is USA-centric. Lots of the low-salt, low and non-fat items found in US stores just aren’t found everywhere. I am dying to get ahold of the FlatOut flat breads and they won’t even ship them to the UK. Grrr. Looks awesome!! I bet this will be very helpful! !